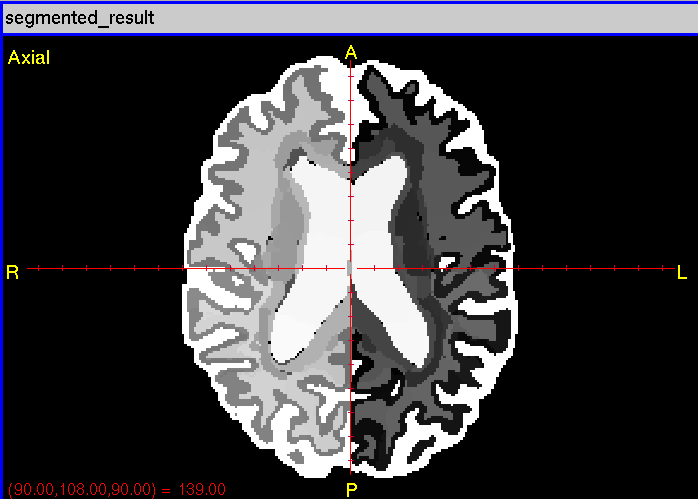 CIS has implemented a process for the segmentation of brain image grayscale data into image maps containing labels for each voxel in the volume which identify the structure the voxel belongs to. The process uses any number (10-30 is typical) of atlas images with their predetermined segmentations. 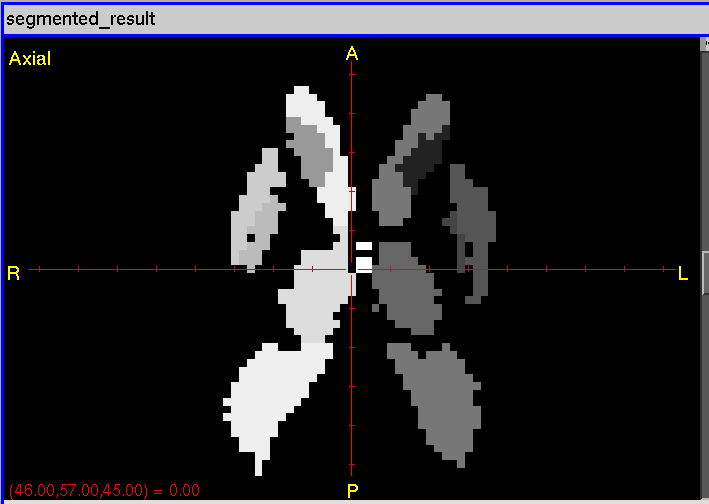 An lddmm deformation is performed between each atlas grayscale image and the segmentation target, then that deformation is applied to the label map for the atlas to place the labels into the space of the segmentation target. Then an arbitration process is performed between all shifted atlas labels to determine the best guess for the label at each voxel in the segmentation subject. Atlas sets from the namespace "/projects/miller" are resident on the ICM cluster and contain labels for subcortical segmentation only. 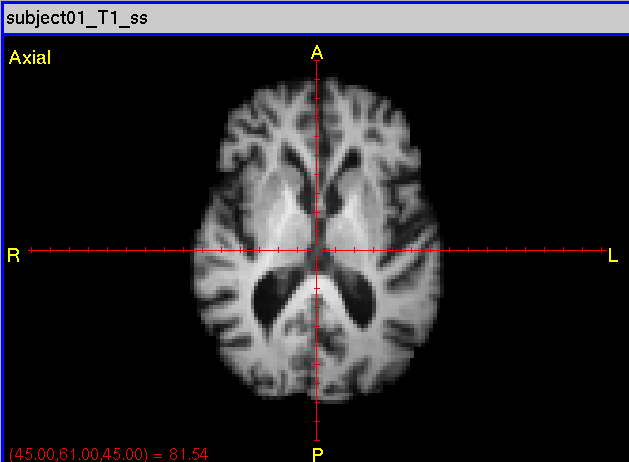 Selecting these atlas sets will invoke remote processing on the ICM cluster, and perform a subcortical segmentation. Atlas sets from the namespace "/cis/projects/" are resident on the CIS "c" cluster and contain full brain structure labels. Multi-atlas can be invoked via ftp. The input file you transfer to the incoming ftp address will be routed to a cluster resource depending on the atlas set you specify. config.txt - configuration file. Specifies the parameters for the matching of the subject T1 with the atlas T1s. Currently the only available Cascading Option is "A", Velocity Field Initialization. Steps - the number of cascading steps. The parameter file must contain an "alpha", " "timesteps" pair for each cascade step. Rename the segmentation target Analyze files to target.img and target.hdr. Login to the mristudio ftp server using your registered email for the password. 220 Welcome to MRI STudio FTP service. -- Turn off Passive Mode. You should receive an email with the subject "CIS (or ICM) auto-seg Processing: 83175596b5df0e69f23b791e16febda0" informing you that your segmentation is being processed. You should receive an email with the subject "auto-seg Process Complete: 83175596b5df0e69f23b791e16febda0" informing you that your segmentation is complete. Get your results from the mristudio ftp server. 150 Opening BINARY mode data connection for Result.zip (1782533 bytes). Unpack your results from the zip file. The segmented Analyze label map is in output/segmented_result.*. In the "Remote Auto Segmentation Advanced Defaults"
Deselect "Set Verbose Output Mode"
Click "Send Auto Segmentation Job". As with the ftp example, you will receive an e-mail notification when the job is sent to the appropriate cluster and queued for processing. You will receive another e-mail when your processing job has completed. That email will contain the md5 sum of the job you submitted. Put this md5 sum in the "Sent MD5 Sum" text box, and click "Receive Auto Segmentation Job". 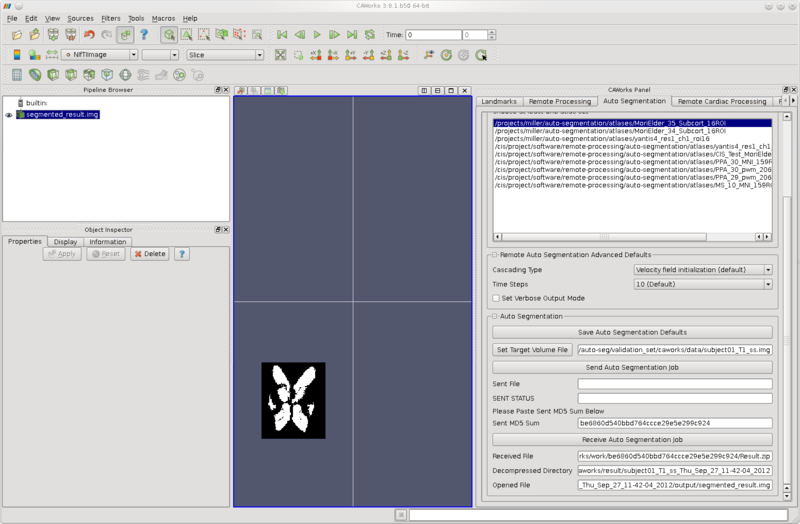 The auto-segmentation result will be stored in your results directory and displayed in CAWorks' 3D view as shown below.